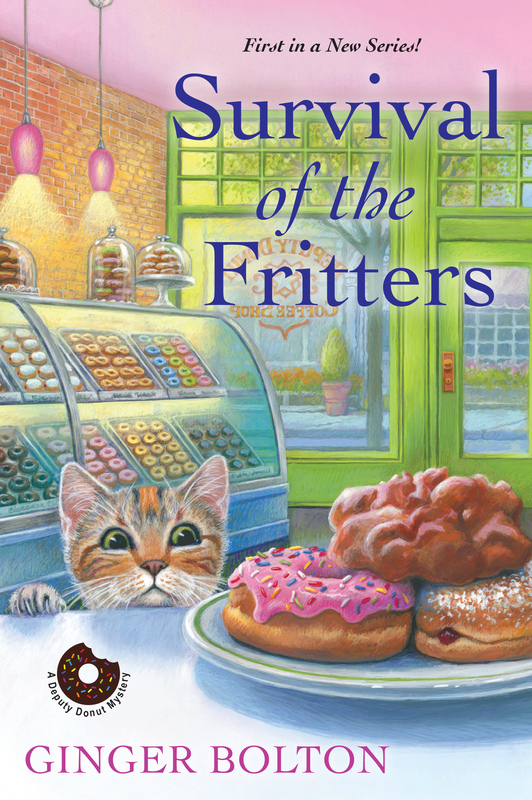 Today, I’m hosting a spot on the Great Escapes Virtual Book Tour for Survival of the Fritters, the first in the new Deputy Donut series by Ginger Bolton. It was a pretty good book and I’ll definitely going to be reading more in the series! The plot line was good. There were enough red herrings to keep me guessing as to who the villain was. I didn’t put it together before it was revealed. It was very well done. I’m definitely looking forward to more in the series! Thanks for joining me today. If you wish to visit other spots on the tour, please click on the banner below to go to the main tour page! Greetings! Today I’m hosting a stop on the Great Escapes Virtual Book Tour for Mister Mottley & the Dying Fall by Ellen Seltz. I enjoyed this book quite a bit! Below my review, you will also find an interview with the author. The Mottley & Baker Mysteries are classic whodunnits set in the Golden Age of 1930’s traditional detectives. If you like Miss Marple’s pastoral puzzles or Albert Campion’s rollicking adventures, you’ll fall hard for this cozy historical mystery adventure. This was a fun book to read. I’ll be honest, I wasn’t totally sure about it when I picked it up. I’ve read a LOT of cozy mysteries this year and I wanted on one hand to hope that this one would be different, but on the other hand, I didn’t want to get my hopes up too much, lest the book not live up to it. I need not have worried. Mr. Mottley & the Dying Fall was a great book and really fun to read. This book reminded me a lot of an Agatha Christie novel in its styling and I liked that. Everyone had secrets they didn’t wish to tell, not just one or two people. It made the suspect field very broad and I never did figure it out until it was revealed at the end! I like the characters. Mr. Mottley and Baker have gotten under my skin and I will definitely be reading more of the series! I highly recommend this to those who enjoy Agatha Christie’s style of writing. It was great! Before I get started with the interview, I wanted to say ‘thank you’ to Ms. Seltz for being willing to answer my questions today! Do you have a day job in addition to being a writer? If so, what do you do during the day? Do you enjoy your day job? Yes, I’m a freelance copywriter and nonfiction ghostwriter. When I wrote my first book, I worked as a legal secretary. In the year after Mister Mottley Gets His Man came out, our family situation changed and I was able to work from home to be present for my children, which was a wonderful privilege! Sometimes I do miss the external structure of an office with scheduled start and end times. But I love the work of writing – even when it makes me crazy. Separating fiction from nonfiction uses different parts of my brain and helps keep me from burning out. Do you set aside time to write every day or do you write more sporadically? When you write, do you aim to complete a set # of pages or words? How does music/other noise affect your concentration when you’re writing? My goal is to write every weekday during designated time slots. For me, the most fruitful time for fiction is early in the morning, between 5:00 and 6:30 AM. I usually have several projects going at once, so my specific daily goals depend on what deadlines I have to meet – a manuscript due to my editor or beta readers, a short story for a contest, a contribution to a group promotion or anthology, and so forth. It’s easier for me to follow through on commitments to other people than ones I make privately in my head, so I network and make those commitments to keep myself on track. When you’re writing, do your characters seem to “hijack” the story or do you feel like you have the “reins” of the story? Similarly, do you outline your book first or just sit down and write, seeing where it takes you? Both! I outline a story as part of the brainstorming process. I’m a huge believer in the power of story structure. Creating the outline forces me to ask myself questions about the characters, the conflict, the setting, the timeline, the pace and tension, the emotional arc, and so forth. Then I use the outline as a set of writing prompts so I always have an assignment and never have to wonder what to write next. Sometimes when a story is flowing well, scenes will pop into my head and I just scribble them down. Those don’t happen in any kind of order, but the outline tells me where they belong in the finished structure. My detective, Mister Mottley, is an incorrigible gadabout with a raging case of adult ADHD (which of course, had not been invented yet.) So he never does as he’s told. I always have to keep my outline flexible to accommodate his impulsive behavior or flashes of insight. In this new book, Mister Mottley and the Dying Fall, my very steady and practical leading lady also went off the reservation a bit. I struggled mightily over the last third of the book, and finally realized the problem. I’d put her in a situation where she needed to be awesome, but I was holding her back for fear of overshadowing the main character. Finally I realized that she would not be stifled. I had to let her be amazing, and just trust that the main character could live up to her. I think it worked out fine. How did you break into the publishing world? How many rejections did you go through before finding a publisher? Did you ever think about quitting? If so, what did you do to keep yourself hopeful? I am an independent author, so Incorrigible Publishing belongs to my husband and me. I did a lot of research and consideration before making that decision, because it’s not something to undertake lightly. It was partly a business decision and partly an emotional one. The marketplace of publishing is wide-open now, just as the film, music and theater industries have opened up and become more accessible to independent producers. Traditional publishing, like film, TV and Broadway, is an industry based on very high capital investment. It has to mitigate risk by placing a lot of gatekeepers between the talent and the audience. The economic landscape of traditional publishing is also heavily weighted against first-time authors and against genre fiction (what used to be called “pulp” – science fiction, fantasy, mystery, thrillers, and romance). That risk-averse system prefers books with a very broad commercial appeal (the “Oprah Effect”) or highbrow literary fiction that attracts critical acclaim. There are voracious readers in every genre, but the big publishing houses don’t spend much money on them – not in author advances, and not in marketing. As an unknown genre fiction author, it made more economic and artistic sense for me to write, finish, publish, and write some more, than to pursue a traditional contract. For the first time, I didn’t have to please anyone except the audience. The whole risk-averse giant industrial business model was just irrelevant. I liked that feeling. I liked it a lot. I no longer see the need to please six layers of people between me and the audience, if I can reach them directly. A writer, and readers – No Spoon. In general, how many revisions do you go through before a book is published? Do you have beta readers or is it just your editing team and their suggestions? Do you set your books aside for a period of time and then pick them up and edit them? It really depends on the book! My first book took three drafts, though now I’d probably call them revisions rather than redrafts. Dying Fall went through a complete rewrite where the structure and plot changed significantly, then a couple of further revisions before detailed editing. The book did go in “time-out” for a couple of months in that process, to make sure I was bringing fresh eyes to it. I have a team of beta readers who know and love classic mysteries, and who are able to give honest, useful feedback. I let them read the manuscript when I can’t get it any further by myself. After I work through beta feedback, I send the book off to a professional editor. I’ve been fortunate to find some excellent British editors who help me localize my language to UK terms (there are always some I miss), and even help with fact-checking and making sure I don’t have any glaring anachronisms. A good villain is hard to write. How did you get in touch with your inner villain(s) to write this book. Was there a real-life inspiration for him/her/it? Oooooh, I can’t answer that without spoilers! The main thing is to look at it from the villain’s point of view and keep them making active, logical choices to pursue their goal. Unraveling a puzzle mystery is one thing, but having the villain stay in conflict with the detective keeps tension going up, up, up. Do any family members, friends, colleagues, acquaintances, etc. end up showing up in your work or are your characters all truly fictional? I have a very lame visual imagination. I can describe anything I can see, but I don’t see imaginary people or places in my head. So I often give characters the physicality of someone I know in real life, but not the personalities. Not directly. My characters’ personalities are a mix of traits I’ve known and observed in others, and ones I find in myself. If you could write about anyone fiction/nonfiction, contemporary/historical who would you write about? Why? Well, I’ve got seven Mottley books in various stages of outline, so I expect to be writing about him for quite some time. I have more ideas than I’ll ever be able to finish, and I’m always snatching ideas from things I read or see. I recently read an article in Smithsonian magazine about Benjamin Franklin’s relationship with his wife, and how the death of his son seems to have driven a terrible wedge between them. He spent nearly the rest of her life abroad in France and England. She wrote him so many letters full of longing, and he would continually promise to return, but then put it off another year. That would make a great epic romance, I think. I picked up an anthology last month of five Hercule Poirot novels. I wanted to re-read Murder on the Orient Express in advance of the movie coming out. I went right ahead and devoured the others as well. I’m in the middle of Death on the Nile right now, and loving it even more than ever. I started reading Agatha Christie as a pre-teen, and it’s just thrilling to re-read them at different stages of life. It’s amazing how they hold up. I always see something new. Earlier this year I really enjoyed Alan Bradley’s Thrice the Brinded Cat Hath Mew’d. It was my first Flavia de Luce mystery, and it turned me into an instant fan. I also got about two-thirds through Ann Patchett’s State of Wonder, but I had to put it down because I was so attached to the characters and I could tell something horrible was about to happen. I just knew it would gut me, and I couldn’t handle it. A friend assured me it wasn’t as bad as I feared, so I’ll probably try to finish it over Christmas break. It’s a beautiful book. Her prose is hypnotic and immersive, and it hooks you hard. Probably The Screwtape Letters by C.S. Lewis. It prompted a real epiphany for me. I wrote it about it on my blog. If you could spend one day with a character from your book who would it be? And what would you do during that day? I would really like the female lead, Susan, to take me shopping in London. She has exquisite taste, and she’d be the sort of friend who can tell you something looks awful without making you feel bad about yourself. She’s also filthy rich, so she can pay for it, too! Do you read your reviews? Do you respond to them, good or bad? Have you ever learned anything from a bad review and incorporated it into your future work? I do read them as a business exercise. There are so many different kinds of tastes and readers, there is something for everybody. I think if a book is written to basic standards of competence and decently edited, then bad reviews usually reveal a marketing problem rather than an artistic problem. You have to make sure your covers, description, and marketing efforts are reaching the sort of readers who will enjoy what you do. On the other hand, sometimes bad reviews can be a valuable heads-up. The first Christmas after my first book came out, I released a Christmas short story to flesh out the series. I was hard at work on Book 2, and really didn’t give the story the time and attention it deserved. It was a fine basic idea, but I just didn’t flesh it out enough and it didn’t work. The readers told me so. It got terrible reviews, including one particularly pithy one that said “THIS SUCKED,” in all-caps. Ouch. But they were absolutely right. I pulled it down and put it aside. This year I totally reworked it, and I’m very proud of the result. It develops an interesting part of Mottley’s backstory, and connects to some overarching themes in his development and his relationships to other characters in his world. It’s also a lot of fun. The new version is called “Mister Mottley Pulls a Cracker,” and it’s coming out soon in a holiday-themed collection titled Happy Bloody Christmas. Thanks for hosting me, Valerie. I always look forward to getting to know more mystery readers! I’m happy to answer questions anytime on Facebook or by email at ellen@ellenseltz.com. Mister Mottley and the Dying Fall is available now in ebook and in paperback. Find it at your favorite retailer via www.books2read.com/DyingFall. You can also receive a free Mottley book by joining my Reader’s Circle at www.ellenseltz.com/meet! This is the second batch of mini reviews for Kate Carlisle’s Bibliophile Mystery series. The first batch of mini reviews can be found here. Page of Sin is a novella that comes in between Murder Under Cover and One Book in the Grave. This is one of my favorites in the series. And the reason I like it so much is not only do we get a pretty interesting mystery to solve, but much of this novella features Brooklyn, her mother, and their relationship. We don’t always get to see a lot of their relationship since they live an hour apart, but we get that rare glimpse in this novella and I really enjoyed that! This is only available as an eBook, but it’s well worth reading, even if you’re not usually a fan of eBooks! This is another one that I really like, except for the ending. I felt the ending was a little weird. I know to an extent it was supposed to be weird. The cult that’s involved is weird. It just seemed weirder than I was expecting. That’s the only reason this one doesn’t get a full 5 stars. I enjoy this one a great deal because we learn a lot about Brooklyn’s history and friends before we met her in Homicide in Hardcover. There are lots of great action and a fascinating mystery! Enjoy it today! While the writing in this book is well-done, just like the writing in most of Ms. Carlisle’s books, this one is one of my least favorites. I think it’s because for the majority of the book, Derek isn’t with Brooklyn and the assignment he’s on makes waves between him & Brooklyn. I love the two of them together so anything that makes waves between them and causes real conflict makes me nervous! While not my favorite in the series, I do like this one a lot. I like the subplot (no spoilers! ), the characters, the way we learn just a little more about Brooklyn’s life before the series started, etc. We learn more about Brooklyn’s relationship with her sister, Savannah, too, which I always enjoy the interpersonal relationship backstories.